Police in Houston have filed capital murder charges against a second man in connection with the drive-by shooting death of a seven-year-old girl. 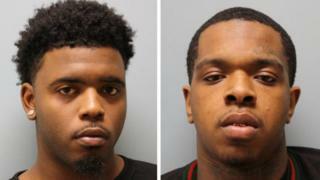 Police say Larry Woodruffe, 24, killed Jazmine Barnes after he fired into her mother’s car on 30 December. He and Eric Black Jr, 20 – who authorities say acted as his getaway driver – have now been charged. Police say the killing arose from a case of mistaken identity and that the family was not deliberately targeted. Tuesday’s arrest came as Jazmine’s funeral was held – her family opted for an open coffin before the ceremony at a Houston church. Jazmine’s mother, LaPorsha Washington, was in the car with Jazmine and her three sisters near a Houston-area Walmart store on 30 December when a red pick-up truck pulled alongside them and a man inside opened fire. Ms Washington was shot and injured in the arm. Ms Washington tearfully recounted the attack from her hospital bed and urged the gunman to give himself up. A $100,000 (£79,300) reward for finding Jazmine’s killer was also offered. Both Eric Black and Larry Woodruffe were arrested on Saturday as the result of a tip-off, Harris County Sheriff’s Office said. Who is the man in the photofit? Both men charged are black but a photofit of a suspect released last week showed a white male believed to be in his 30s or 40s. Campaigners had feared the shooting, targeting an African-American family, might be racially motivated. When the suspect was wrongly identified as Robert Cantrell, his photos were circulated online by bloggers. Police now believe the man in the photofit was a witness that Jazmine’s sisters remembered, not a suspect, WABC-TV reports. His niece, Hailey Cantrell, said that threats had been sent to her Facebook page and she asked people to “back off”.